I'd forgotten how annoying I found the process of making lasagna to be. Mostly it's the wet noodles that drive me up the wall. Maybe I should look into this "dry" method I've heard tell about. 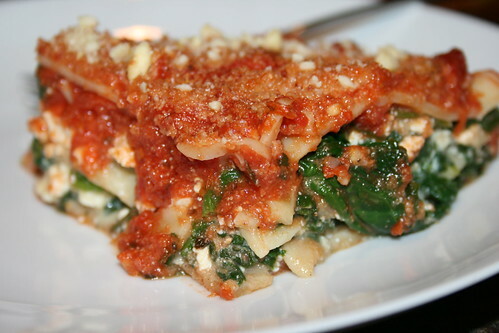 Until then, I'll tell you about my successful experiment in which I made lasagna with okara. I only used 3 cups of tomato sauce; the recipe below will call for a bit more, because even though I made those 3 cups work for me, I really was spreading it pretty thin. Also, I intended to put some fresh basil in the filling, but completely spaced out on that! The final product tasted great, and it didn't occur to me until hours later that I had left the basil out. according to the instructions given on the package. When they finish cooking, drain the noodles and set aside. Stir spinach, coating it with the oil and garlic. Cover the pot and allow the spinach to wilt, stirring occasionally. When it's nice and wilted, remove the lid from the pot and allow the excess water to evaporate, or merely drain the excess water through a colander. Set spinach aside. I left some pretty good-sized chunks of tofu in there because that's how I like it. If you want more finely crumbled tofu, go to town. Note: The reason the tofu-to-okara ratio is kind of weird in this recipe is because the tofu I buy comes in 20-ounce blocks. I wanted a total of two pounds of tofu and okara. You can probably mess around with this ratio if you buy tofu in 16-ounce blocks and don't want to deal with measuring 20-ounce increments of it. to the mixture to assist the blending process. 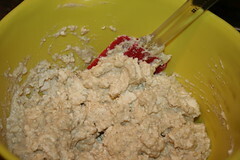 Scrape the okara mixture from the blender or food processor and add it to the crumbled tofu. 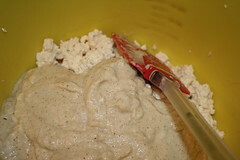 Mix the okara and the tofu thoroughly, taking care not to bust the tofu chunks up too much. 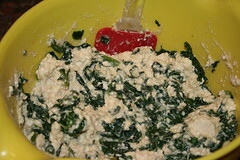 Then add the spinach to the mixture, incorporating it well and continuing to take care not to break up the tofu chunks. on the bottom of the pan, coating it completely. Assemble the lasagna: a layer of noodles, a layer of marinara sauce, half of the filling, another layer of noodles, more marinara sauce, the other half of the filling, another layer of noodles, and more marinara sauce. Note: I finished my lasagna off with the almesan from Veganomicon -- but you can also use commercially available vegan parmesan or forgo this added flourish entirely. Cook for 35 minutes at 350 degrees Fahrenheit.